Like most good stories, this one starts in a pub. For over a decade my band, Saint Etienne, has worked with director Paul Kelly on various short films and documentaries, beginning with Finisterre in 2002. Five years ago, Paul asked me to meet him at the Old Red Lion in Islington, North London, as he had an idea for a new film. He had seen Terence Davies’s rumination on his home city of Liverpool, using 20th-century archive footage, and wondered what an archive-only film of London could look like. We went back to his flat and watched the film three times on the spin. It was very moving, peppered with unexpected moments like footage of the Korean War soundtracked by the Hollies’ He Ain’t Heavy, He’s My Brother , and Davies’s snarling dislike of the Beatles. It was very personal; it made Liverpool seem both grand and pitiable. The city Davies had grown up in was no longer there — he could never go home anymore. Could we make anything as impressive? As luck would have it, I had been contacted by Tony Dykes of the British Film Institute, a gentle soul who knows more about public information films and the Children’s Film Foundation than anyone I’ve met. He had asked Saint Etienne to record new music for a couple of Design Council films from the Sixties; I went back and talked to him about Paul’s idea. Within a few weeks we were watching boxes of old video tapes in a breezeblock cupboard on the roof of the BFI’s offices, right next to a storeroom covered in hazard signs that contained canisters of highly flammable old films. We spent the next three months going through hours of BFI archive footage of London, 95 per cent of which involved Piccadilly Circus, the Royal Family or aerial shots of the Tower of London. If we weren’t to be blown up by flammable footage of Marie Lloyd first, we might just find enough material to make our own film. One of our most exciting finds was a magazine series called London Line , which ran from the mid-Sixties until the early Eighties — the reason you may not remember it is because the series was distributed primarily to the Commonwealth by the Central Office of Information, and was never screened here. The presenter, Michael Smee, was engaging and likeable, somewhere between Thunderbirds’ Jeff Tracy and Nationwide’s Bob Wellings. He visited Carnaby Street, the new towns ringing London and the Rothamsted agricultural research centre where he tried “leaf protein”, a green sludge that was set to wipe out world hunger by 2000. London Line exemplified an atmosphere that we wanted to get across in the film — the optimism of the “New Elizabethan era”. Davies’s film showed Liverpool in its brief postwar pomp, with celebrities visiting Birkenhead for film premieres, before its steady slide into poverty and unemployment thanks to recession, cack-handed redevelopment and an uncaring government. London’s fortunes since the 1951 Festival of Britain had ebbed and flowed but spirits were largely buoyant. The city may have smelt of damp wool and coal dust in winter, but from teenagers finding a sense of self in Fifties coffee bars through to the late Seventies when punks congregated outside the Rough Trade shop, there had been a sense of optimism. Our film, How We Used To Live, ends with the dawn of the Thatcher era, a different time in which the Square Mile — almost always at odds with the actual inhabitants of London — began to assert its strength, starting with the land grab of the former docklands. The hopes of the New Elizabethans, and the bright primary colours of the Festival of Britain, were finally squashed to be replaced with shades of grey. In the Eighties money no longer chinked like small change in your pocket — it crackled like a forest fire. 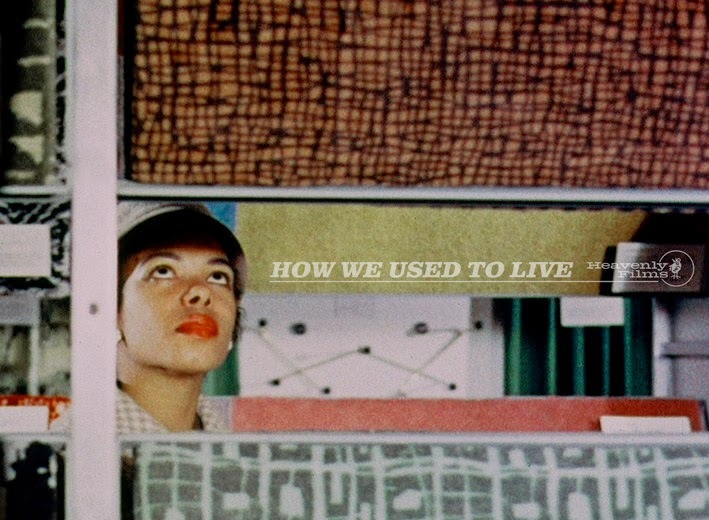 How We Used To Live wouldn’t be a personal film, like Of Time and the City — it couldn’t be as we were too young to remember most of the period we were covering. Writer Travis Elborough was brought in as a researcher and adviser, bringing in folders full of astonishing stories, most of which — such as the vicious St Pancras rent strike of 1960 — never made it to the final script. My Saint Etienne partner, Pete Wiggs, came up with a complete, and quite beautiful, 70-minute soundtrack. For a short while we were unnerved by the news that Julien Temple was planning a similar film commissioned by the BBC, also using BFI archive footage. In the end, it worked to our advantage; watching London — the Modern Babylon last summer convinced us that telling the story chronologically wasn’t the way to go — whichever part of Temple’s film you were watching, you always knew what was coming next. London’s story is too familiar for a decade-by-decade telling. Paul edited the BFI footage we had uncovered impressionistically. It often looked like he had shot it himself, as if he had a Tardis and a Super 8 camera. The cherry on the cake was convincing Ian McShane to narrate the script, from the point of view of a London arriviste in the Fifties who had left again at the turn of the Eighties. His story wasn’t that dissimilar. London is currently going through its greatest structural upheaval since the Sixties. It can often feel as if everything I love about the city — its irregular architecture, its cafés and pubs, the anticipation that something new and great is just about to spring out of some unexpected corner — is under threat or disappearing. It can be dispiriting to see the return of Union Jacks on the Mall, the potential destruction of hundreds of homes to make way for HS2, the scale-defying glass and steel new-builds that are almost inseparable from buildings in Tokyo or New York or Jakarta. Yet going through the footage for How We Used To Live — the miles of film devoted to the Royals, the fawning to bankers and the City, the slivers we excised of real Londoners living their lives — it became obvious that nothing beyond the details had changed. How We Used To Live is remarkably similar to the way Londoners live now.